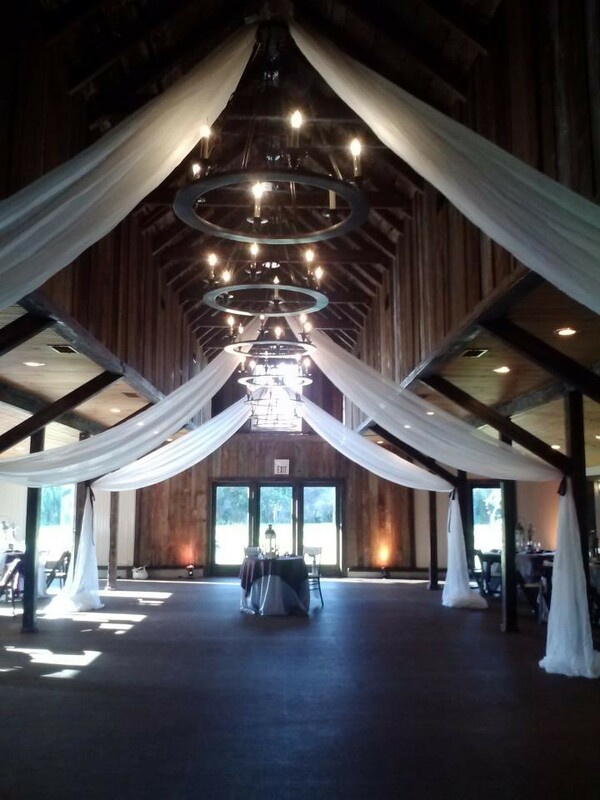 Charleston wedding draping can be a lovely highlight or in some cases even a defining creative piece when considering décor for your special day. Ceiling draping can be not only a functional way to cover up aspects of your wedding venue that you may find unappealing, such as unattractive beams or dull fixtures, but also a beautiful and luxurious backdrop to your reception that will dazzle your guests! One simple, yet effective method is to attach the fabric to one end of a beam or ceiling fixture so that it sweeps down prettily and then ties at the other end. This creates an elegant look but can also draw attention from beams and fixtures, making the draping a much more decorative and attractive focal point in the room. Another technique, referred to as the “starburst” method is to attach fabrics to a chandelier or ring centered in the room so that they cascade outward in all directions. 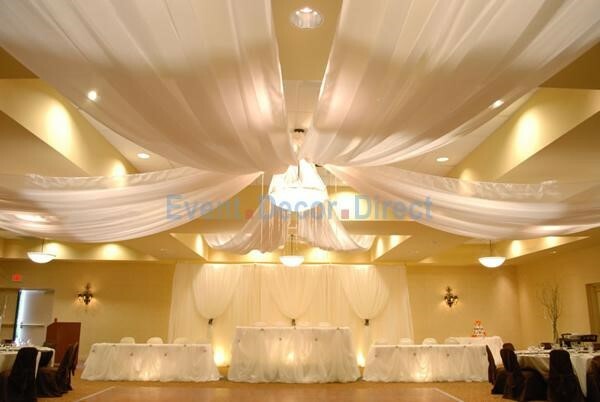 This form of ceiling draping creates a stunning visual for your wedding venue. 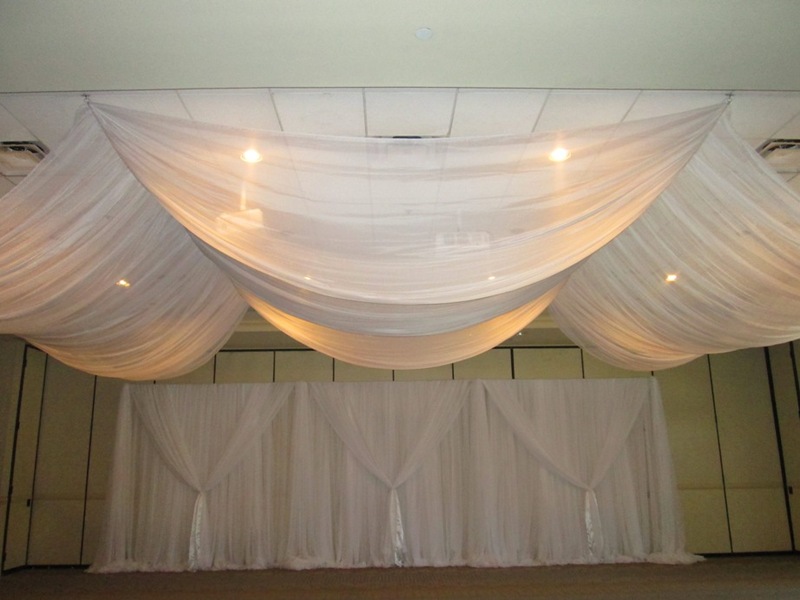 “Swoop style” ceiling draping is a lavish way to decorate your venue. This method can cover the whole ceiling, which is especially useful if your Charleston wedding venue has an outdated or unsightly ceiling. 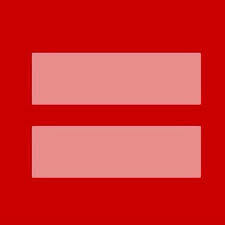 It can also be hung in large decorative sections if preferred. The fabric is attached and hung in a way so that it creates elegant swoops across the ceiling. When done with the right technique, this look can really polish the look of your venue with exquisite style. It’s important to know how this form of décor will impact your budget. The good news is that Tanis J Events has their own custom technique that is definitely budget-friendly, while still maintaining high quality. The fabrics used for draping are not custom cut which makes them reusable. This is not only environmentally friendly, but also cost effective. You would be simply renting the fabrics instead of purchasing them which equals a major savings to brides wanting to enhance their wedding with draping. Tanis J Events also uses a method of securing the fabrics with magnetic poles, which allows them to be able to drape in venues that do not allow anything to be stapled or pinned to the ceiling and walls. The use of magnetic poles also eliminates the need to use a ladder to do ceiling draping so it drastically cuts down the set up time involved and the amount of labor required. Not only will the venue be appreciative of this technique for Charleston wedding draping, but your wallet will be as well! 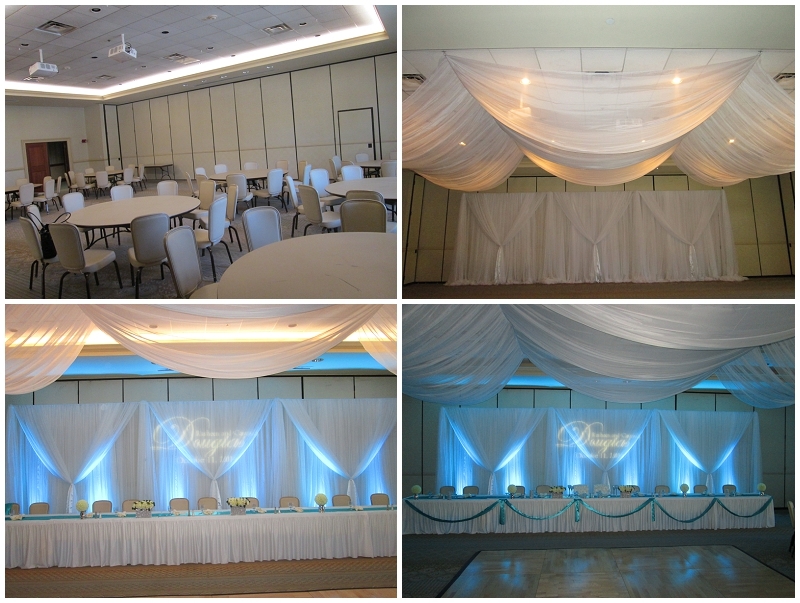 Room transformation with Charleston wedding draping swoop style and backdrop.